BABA you know that i have always helped your devotees. Then why BABA those who i have helped hurt me. Sai baba they tell me that you should pray with a clean heart. BABA where am i lacking in my devotion for u never seem to answer my prayers. Even your devotees laugh at me now? Then why do YOU tell us to do good? Re: I am always hurt?why? Mina dear it happens to true devotees like you. One thing I would like to suggest you that do whatever good to other but don't expect anything in return.....not even their thanks....it is in our ignorance we expect in return for our goods. BABA SAI Ki tumne aage ki baat par diyan nahi kiya......Neki Kar aur Kuain(Well) main daal.....Do goods and throw it in Well and never look back. I don't expect anything.............not even thanks........but when i help others there problems get sorted out...........not mine?so they laugh at me and feel good. They only cry at my shoulder and when happiness knocks at there door ......they enjoy with others. Why can't they also cry with others instead of me? what Sai baba has to say on this? when will he answer my prayers? People tell me BABA cannot anawer your prayers? why should i then help those who laugh at me? You are saying that you are not even expecting THANKS......but in your ignorance, YOU ARE. Because you are asking them to share their joy and happiness with you. And it is not your fault. It is human-being nature. I am very much like you. And people do the same with me too. I feel bad when share their problems and tears with me BUT NOT HAPPINESS. But whenever you feel like this again........just think of BABA. Think that BABA is always with you. When BABA is sharing everything ...his love, blessings and happiness...with you why do you want human-being to share their happiness, which is not real. Instead of asking BABA to punish them, ask BABA to make them realize it. Ask BABA to bless them and show them the right path. If people are saying that BABA cannot answer your prayers. THEY ARE WRONG. Sometime BABA test the patience and FAITH of his devotees and then do the best for them. So dont listen to them. HAVE FAITH AND KEEP PRAYING......THEN SEE WHAT BABA IS DOING FOR YOU. BABAji, please bless Minaji and make her happy. "I am always there with you"
OMSAIRAM!Minaji,BABA is always with u.
BABA WILL SURELY ANSWER YOUR PRAYERS. therez a nice bhajan which says sainath tere hazaron hath jis jis ne tera naam liya tu chal diya unke saath!! u r perhaps one of his favourite child thats y he wants to test a bit of ur patient. At the end u will definately win the hearts of the ones who dnt bother your feelings now this is my belief. Things have changed in this world nowadays. You have to be very firm...no requests for anything...God does not allow any changes in his administration/management.He is very firm in his resolve. We cannot change that.We are toooooooooo small to change that. Things will happen the way HE wants them too. Nowadays Bad things happen to good people and good things happen to bad people. Welcome to our abode of Baba..........the abode of good people. Then the best way is stop expecting anything from anyone, including yourself...No expectations..........No problems...we will the have a trouble free life. Shailu Dear (Mili) Welcome to BABA SAI's Blessed Online Mandir. Yes! You are right "jis ne tera naam liya tu chal diya unke saath" Whosoever remember your name you start walking with him, beside him. Here I would like to add....even HE can't change the "VIDIHI KA VIDHAN" unless we help him do so.....For that we have to surrender to HIM. It is we who have to change our "Drishti Kone" (Angle of Vision). We have to support HIM and without our support HE can't even move. We are made for each other. If we move towards HIM, HE he moves towards us, if we sit beside HIM, HE sits besides us, if we walk towards HIM, He walks towards us. This all can be done of course with HIS GRACE only. Without HIS Grace nothing is possible. First we have to surrender our Shortcomings and Vices and to work according to HIS PRECINCT to earn HIS GRACE. Without us HE is nothing.....because HE is everything in HIS nothingness. Welcome to this blessed Family of my Baba. In your post, I can feel the fregnence of true love for my Baba. Like Ramesh Ji has rightly said, it is truly our expectations from others as simple as a Thanks, Smile , Including us in their lives as we do to them are all causes to let us down.I have not read the Gita or ay of our Hindu leterature, but as it is said there, Krishna said do what you can and do not expect results. If you feel happy that you did the just thing, even for a moment,that supercedes any other feeling that may follow. Baba is watching everything, somehow surrendering ourselves to him (as it may seem to come as an excuse even to many of our shortcomings) let's him take care of us completely. So just hang in there and think of Baba. This prayer I pasting here for you and others. Everytime I read this..my griviences vanish and I feel better tremendously. Hope this helps. May Baba show you the right way. Om Sai Ram! happy thoughts. Take away my self-pity, I don’t want it. Take away my ill will towards others. Make it possible for me to feel joy, love, and compassion. to let go with love. Take away my worry about the future. Make me realize that in your hands everything will be provided. actions. Make me know that today is precious and will soon be gone. Help me to remember that all hatred and pain directed toward me are the hatred and pain the other person is feeling toward him self. Thank you for your willingness to accept my burden and lighten my load. I love you Baba ! om sai shree sai jai jai sai!! "VIDIHI KA VIDHAN" unless we help him do so.....For that we have to surrender to HIM. 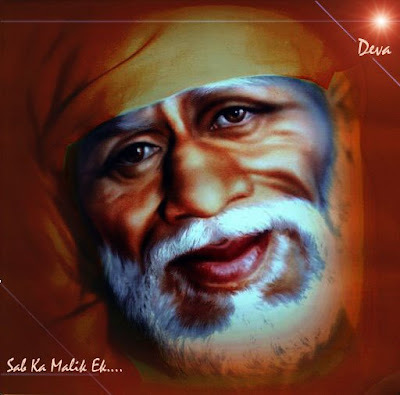 We can't become Sai Devotees even if we want to unless HE chooses us...........then what to say of "VKV"
BABA can do anything.........so please don't say all that. I think you should be careful when writing about BABA .....choose your words carefully...so that it does not hurt anyone. I think no one has told you this. Page created in 0.257 seconds with 66 queries.